There is without a doubt a continued rise in NFL League/ team sponsorship and the amount of revenue that comes from it. This past season, the 32 teams in the league generated a record $1.39 billion in sponsorship spend, up from $1.3 billion in 2017. According to IEG research, estimated sponsorship spending on the National Football League rose 5.1% in the 2018-19 season. Factors driving NFL revenue growth include increased spending and new deals signed at the league level along with new sponsorship opportunities created from casino and gaming brands. We’re taking a look into the brands making sponsorship success possible for the NFL. Bose serves as the NFL’s official headset provider, with branded equipment displayed by the league’s coaches and referees each game. The new replay system implemented prior to the 2018 season gave Bose greater exposure with their devices being brought onto the field whenever officials see a need to communicate with the league office, which added a lot of value to the Bose partnership. According to Hookit, the NFL is Bose’s largest area of spending in the sports realm with 41% of their total sponsorship dollars going towards their partnership with the league. Throughout the 2018 season, Bud Light produced team branded cans for 28 different teams in the NFL league. Budlight’s parent company, Anheuser-Busch is the official beer sponsor of the NFL. While the company doesn’t have local partnerships with every team, the ones they do partner with were able to buy designed beer cans that feature their team logo, as well as a customized color stripe- allowing fans to drink to their favorite team in style. Bud Light spends 34% of their total sponsorship dollars on American Football, with top teams including the New Orleans Saints, Denver Broncos, and Cleveland Browns to name a few. Working to help athletes acquire their most efficient hydration levels, Gatorade partners with the NFL in order to spread brand awareness and invest in influencer relationships with various athletes. Gatorade is a product that has become inseparable from sports in general – football in particular. Their partnership officially began in 1983, and ever since then, the Gatorade logo can be easily spotted during each game on the sidelines or after each game as it’s being poured onto coaches in celebration. According to Hookit, Gatorade spends 22% of its total sponsorship dollars on American Football, and 42% on the athletes specifically. The official chip and dip sponsor of the NFL, Tostitos is a proud supporter of tailgating and improving the NFL fan experience as a whole. Prior to the 2018 NFL season, Tostitos introduced the stadium sofa as a way to embrace gamedays from the comfort of your own home. The sofa includes built-in charging stations, a fridge drawer, tablet holders, LED lighting for team colors, Tostitos chip and dip bowls, a trash can and of course cupholders to support all of your game day needs. Of their total spend, Tostitos focuses 80% of their sponsorship spending on American Football, with 100% of those dollars going to specific athletes such as Dak Prescott, Matt Ryan, and Devonta Freeman. In December of 2017, Verizon signed a five year deal with the NFL, giving the league greater distribution as people shift their viewing habits. The partnership allows Verizon’s products to be more available to fans, particularly for younger audiences who view games on their mobile tablets. Verizon plans to experiment with augmented and virtual reality and also hopes to use their NFL partnership to produce original content across Verizon’s network of sites. Verizon’s main sponsorship is with the NFL after recently losing its sponsorship of the IndyCar Series and the NBA in March. American Football makes up 56% of Verizon’s total sponsorship spend, particularly with athletes at 65% of spend. Through 2020, Nationwide will continue to serve as an official sponsor of the NFL and will retain the honor of presenting the Walter Payton NFL Man of the Year Award, which is awarded to an NFL player who has dedicated a generous amount of time to volunteer and charity work while also demonstrating excellence on the field. The company serves as the official auto, home, and life insurance sponsor of the league and also contributes a great deal to the NFL Honors, a football and entertainment event that highlights the best players and plays from the season. According to Hookit, 45% of Nationwide’s total sponsorship spend can be attributed to the NFL, and 52% to the athletes specifically. 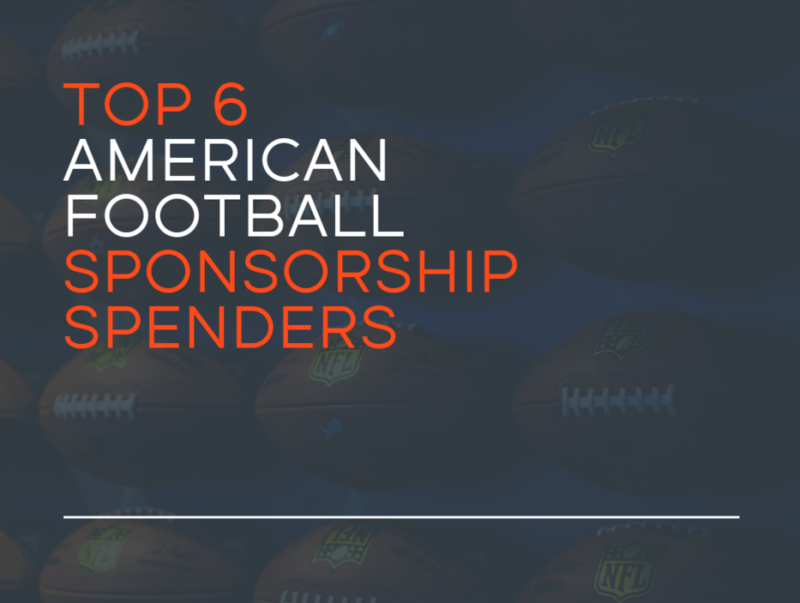 While this list doesn’t cover each and every sponsor of the NFL, it gives a few examples of brands spending a majority of their sponsorship dollars on American Football and highlighting the different agreements associated with each partnership. Overall, the 2018 spike in sponsorship is largely due to the US gambling industry. The NFL has successfully leveraged the ability to sign betting and gambling partners, allowing the league to increase sponsorship despite a prior season of declining ratings and no new stadiums opening in 2018/19. After almost a 6 percent jump in sponsorship spending across the 32 NFL teams this season, the increase in sponsorship dollars has the potential to increase tremendously as brands seek sponsorship opportunities related to sports gambling. Once things take off in the realm of legal betting, it will be one of the largest sponsorship categories according to sources.